Channeling his classic Disintegration Loops, William Basinski's A Shadow in Time contemplates life and death with great clarity. While nostalgia has undoubtedly been an active component of human life since time immemorial, the recent digitization of culture means that the things one experienced yesterday or years ago are more readily available and tactile than they might have been when committed to memory. (Comedian Patton Oswalt coined this concept “Etewaf”, meaning: “Everything That Ever Was — Available Forever.”) This creates a false sense of security with memory -- we no longer have to commit things to memory because we have things that will remember for us. The uneasiness of cultural memory has been uniquely tackled by brilliant musicians like Daniel Lopatin of Oneohtrix Point Never and the electronic wizard James Ferraro. In their respective recorded outputs, there is an equal amount of the “Hey, remember this?” nostalgia along with the more sinister, anxious feelings that the feedback loop of technology and culture creates in us. The experimental composer William Basinski has similarly made music that reflects this memory zeitgeist but complicates it further through his creative process and the music’s effect. Basinski’s music is process driven, made up of loops that elongated and, sometimes, shrink over time. Once you start listening to a Basinski piece, you might recognize an element -- whether it be strings or a synthesizer -- but then, through his looping, it will iron out into a drone, with artifacts making it more and more textural than before. In this way, Basinski’s music mirrors our process of remembering: it starts with experiential clarity, but then moves more and more to associative fuzziness, an unreality. And through the generous lengths of his varied works, we are afforded the time required for contemplation and the forming of impressions and memories. But our memory of one of his particular pieces is shifting, incomplete, and distorted just like the music -- it’s not as easy as remembering a chorus the second time it comes around. His new release, A Shadow in Time, shares strong similarity with his most famous work, The Disintegration Loops. 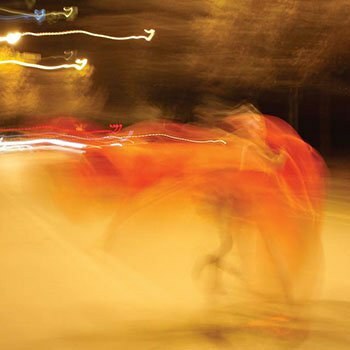 While Basinski made the music in the months preceding the 9/11 attacks, The Disintegration Loops, released in 2002 and 2003, quickly became historically significant for their associative power. Made with actively decaying pieces of tape, the loops feature actual loss of fidelity the more they were played. By recording them this way, Basinski was able to simultaneously bring to mind mourning while also providing a real expression of loss. The second piece on his new A Shadow in Time album, “For David Robert Jones”, a lengthy tribute to David Bowie, employs similar processing and sonics to The Disintegration Loops but, where the Loops became a mirror to the events of that time, this new piece employs hindsight, augmenting the decaying music with saxophone loops reminiscent of David Bowie’s own saxophone playing on “Subterraneans” from Low. Bowie learned the saxophone as a teenager, and it showed up throughout his recorded output, featuring beautifully on “Changes” and “Sound and Vision.” Basinski choosing to channel this instrument -- versus Bowie’s voice -- is a nuanced choice because it hearkens to something that clearly was important to Bowie himself. In “For David Robert Jones”, the saxophone seems to seek its way through the din, making itself known, stretching and thriving to prove its vitality. It’s a beautiful tribute that is enriched by knowledge of both these artists’ work--a musical conversation in which the spirit of the deceased is expressed in the process of an acolyte. A Shadow in Time’s titular track is very different from its successor. Far more minimal, it takes a widescreen approach with shifting strings, calling to mind liturgical music and the sweep of Tim Hecker’s work. Elements are introduced and subverted like oceanic shifts, mining a simultaneous weightlessness and heaviness. The piece coheres better than “For David Robert Jones”, deftly moving through its sections, creating a holistic space and the implication of a narrative journey. It feels intuitive to read “A Shadow in Time” as a depiction of a life to death experience with its tumultuous grandeur. This only feels natural as it’s preceding a knowing tribute to a deceased man. Like most of Basinski’s work, context provides a lot. But, even without knowing anything about Basinski himself or the climate in which he’s created his work, the listener herself would still be able to create their own world around it, such is the power of his music.